'Peak Oil Theory' Demands Energy Alternatives Plummeting gas prices have given consumers relief, but oil pessimists believe the current slump in demand will pass. According to the "peak oil theory," world oil production has already peaked, and supply will disappear very soon without alternative energy sources. 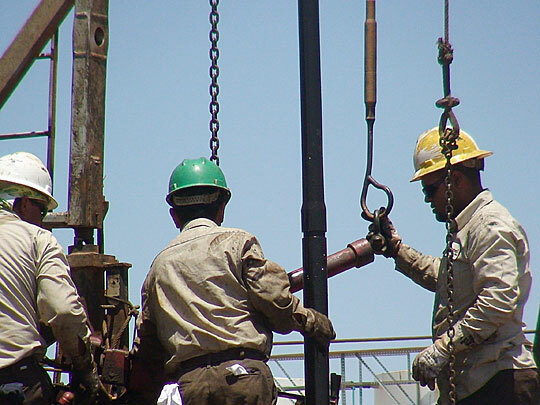 Oil workers operate a rig in Midland County, Texas, in June 2008. Report By The International Energy Agency Supports "Peak Oil Theory"
Plummeting gasoline and diesel prices have given consumers relief at the pump. But oil pessimists believe the current slump in demand will pass. And when it does, the world will be in the same fix it was before the global recession. The era of easy oil is behind us. According to those who believe in what's called "peak oil theory," world oil production has already peaked, or flattened, and in the foreseeable future, the declining resource will inevitably change the way we live. A group in Austin, Texas, meets once a month to prepare for the end of oil. They call themselves Crude Awakening. "When gas prices peaked here about six months ago, we had the largest meeting in July. We had about 25 people show up," said Brian McNerney, a 46-year-old retired Army lieutenant colonel. On a recent night, about a dozen people showed up. What this group does — and dozens like it around the United States and the globe do — is trade lifestyle tips on how to kick oil addiction. "I've been aware of peak oil for about three years now. And since then, I've personally changed my life. I got rid of my cars and get around by bicycle 90 percent of the time," said Paul Karagas, who is 44 and works in the semiconductor industry. The group discusses things like bicycle maintenance, the best hybrids to drive, gardening, shopping locally and installing solar panels. Each has had his own crude awakening, said Greg Bowsner, a 37-year-old network administrator. "Oh my God, I think it's oil that's really going to be the first thing that smacks us in the face and forces us to confront the fact that we cannot live this way any longer, that this is not sustainable," he said. On the meeting night in early November, there was big news. The usually staid International Energy Agency in Paris had just issued an alarming report that concluded what is needed is nothing short of an energy revolution, a rapid move toward low-carbon societies. "I don't know if y'all have read this or not," said the night's speaker, Michael Osborne of Austin Energy, the city-owned utility with a national reputation for energy efficiency, "but the first paragraph of the executive summary says, 'The world's energy system is at a crossroads. Current global trends in energy supply and consumption are patently unsustainable. But that can and must be altered.' "
Oil industry executives don't doubt that world oil production will one day peak. The debate is over when. The orthodoxy — set forth by most major oil companies, the Organization of the Petroleum Exporting Countries and the U.S. Energy Information Administration — is that the inevitable plateau is still decades away, probably past the middle of this century. And by then, we'll have even more renewable energy sources in place, and even better technology to extract hard-to-get reserves. So, their message is — don't panic. "What I have a problem with is that global production will peak in the very short term and then the tank will run dry very quickly thereafter. I don't think it's quite as black and white as that. I mean, clearly we're dealing with a finite resource, but we see strong growth in oil supply unfolding in the next few years, and there is a strong inventory of new projects of oil already discovered," said Peter Jackson, senior oil industry analyst at the influential Cambridge Energy Research Associates. He's the author of a 2006 report, "Why the Peak Oil Theory Falls Down." Jackson points to major new deep-water projects in Brazil, Angola and Nigeria and the expectation of plentiful nonconventional oil from Canada and Venezuela. His optimism is in contrast to the dire predictions of peak oil's foremost prophet, Matt Simmons. "I am saying the sky is falling. If we ignore peak oil; worse, if we laugh about it, continue consuming, we will have a massive shortage," Simmons said from his office in Houston. The garrulous, 65-year-old oil-field investment banker said the world's giant oil fields are all in decline — from the North Sea to Mexico's Cantarell field. "Energy reality, if you take off rose-colored glasses and just study data, is that crude oil in most non-OPEC countries is now in decline, and in too many countries in steep decline. Virtually all of the OPEC producers, with the exception of Angola, are really struggling to keep their production flat," he said in a recent speech to the Houston chapter of the Young Professionals in Energy. The fresh-faced group listening intently to him comprises the next generation of energy industry leaders. A quick poll of them revealed they're not as sanguine about the future of oil as the current industry leadership. "People don't understand how serious the problem is. Like [Simmons] pointed out, the declines in Mexico are huge, the declines in Venezuela are huge," said Matt Boyd, 34, a geologist for Southwestern Energy. "I think he's a little bit on the aggressive side in believing that we've already peaked," said Mike Cox, 27, with Schlumberger Business Consulting. "But I do agree we have that on the horizon, and there's not an infinite amount of oil and at some point we'll have to deal with the declining curve." Another member of the audience was 23-year-old Andrew Keene, an energy lender. "I think the world is definitely running out of oil," said Keene. "I don't think the predictions that Saudi Arabia can replace 15 to 35 million barrels a day is feasible. And we need to consider some alternatives and some other options."